Mary Beard, Ed Ruscha, and Lorna Simpson. Photos by Robin Cormack, James Wang, and Sten M. Rosenlund. 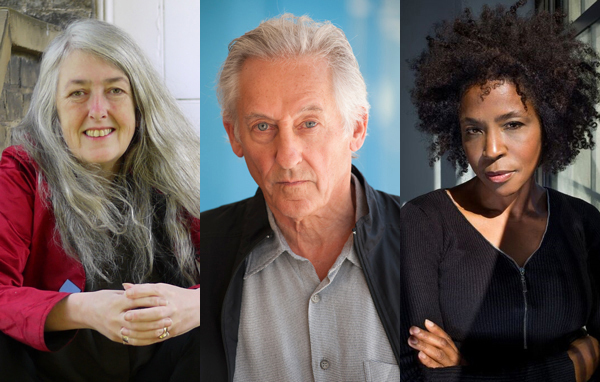 The J. Paul Getty Trust announced that classicist Mary Beard and artists Lorna Simpson and Ed Ruscha will receive J. Paul Getty Medals in recognition of their contributions to their fields. “We are honored to present the medal this year to three leaders who have helped transform and deepen our understanding and appreciation of the visual arts and the humanities,” Maria Hummer-Tuttle, chair of the Getty’s board of trustees, said. Bearda distinguished professor of classics at England’s University of Cambridge and a fellow of the university’s Newnham College, where she has taught for the last thirty yearshas written numerous books on the ancient world, including the 2008 Wolfson Prize–winning Pompeii: The Life of a Roman Town, The Roman Triumph, Classical Art from Greece to Rome, SPQR – A History of Ancient Rome, and Women & Power. She is also the classics editor of the Times Literary Supplement and writes a blog, A Don’s Life. Ruscha, a painter, draftsman, photographer, and bookmaker who calls himself an “abstract artist . . . who deals with subject matter,” studied art at the Chouinard Art Institute in Los Angeles. After graduation, he worked at various ad agencies, where he nourished his interest in graphic and text-based art. Ruscha is known for his formal experimentations, use of the American vernacular, and exploration of the fluidity of language through his often-witty incorporation of words in his paintings. Since his first exhibition at Gagosian in 1993, the artist has had twenty-one solo exhibitions at the gallery, and in 2004, the first retrospective of his drawings was held at the Whitney Museum of American Art. Ruscha represented the United States at the Fifty-First Venice Biennale in 2005 and has participated in Documenta in 1972, 1982, and 1992. Simpson came to prominence in the 1980s with her pioneering approach to conceptual photography. Her early work raised questions about the nature of representation, identity, gender, race, memory, and history that continue to drive the artist’s expanding and multidisciplinary practice today. Simpson earned a BFA in photography from New York’s School of Visual Arts in 1983 and an MFA in visual arts from the University of California, San Diego in 1986. Working across painting, drawing, film, collage, and sculpture, Simpson often creates works depicting African American women and frequently sources material from the Associated Press, vintage issues of Jet and Ebony magazines, and archives of anonymous portraits. Her first midcareer survey was exhibited at the Museum of Contemporary Art in Los Angeles in 2006. Established in 2013 by the trustees of the J. Paul Getty Trust, the Getty Medal has been awarded to eleven distinguished individuals to honor their extraordinary contributions to the practice, understanding, and support of the arts. This year’s honorees will be celebrated in September at the Getty Center in Los Angeles. Past recipients of the Getty Medal include Harold Williams and Nancy Englander, Frank Gehry, Yo-Yo Ma, Ellsworth Kelly, Mario Vargas Llosa, Agnes Gund, and Richard Serra.